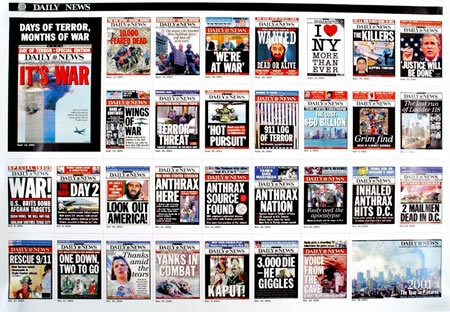 For many of the New York Daily News' staff, the terrorist attack on the World Trade Towers on September 11, 2001 wasn't just the biggest news story of their career; It was what happened to them on the way to work that morning. Providing accurate, complete and timely news in the days that followed was a test of the Daily News' photo staff and presented logistical problems and an enormous emotional challenge to remain detached journalists while covering a story personally affecting everyone in the newsroom. The first challenge for the Daily News' Photo Desk was logistical - and very personal. For many hours after the collapse of The Towers, Daily News photographers at the scene were missing. All survived, one with serious injuries. The others found themselves without cell or landline and no way to get back to the newsroom other than walking. The newsroom lost phone and Internet connections. The number of images arriving at the Photo Desk was staggering. In the first few days, tens of thousands of images were downloaded or scanned into the News' system, then edited, captioned and archived. Along with news images came hundreds of people with photos of missing loved ones. While there was still hope survivors would be found, the News ran over 2,200 headshots of missing people. This brought another challenge for the Photo Desk. Distraught people would walk into the News' office with whatever they had for a photo of their loved ones - including old Polaroids, instamatic film negatives, drivers' licenses or prints that had to be digitized and properly identified. Lee oversaw much of the production throughout the News' coverage. The lessons learned from the weeks following included making specific changes to the way the News identifys and catalogs images in the archive database, and expanding capabilities for importing images to the News' system. The outages in the newsroom started discussions about creating a off-site emergency production facility to protect against future problems. After the August, 2003 blackout, Lee was involved in designing and establishing a new backup photo editing facility in New Jersey. This redundant facilty is fully networked with the Manhattan editing system to allow production to continue without interuption should the need arise.